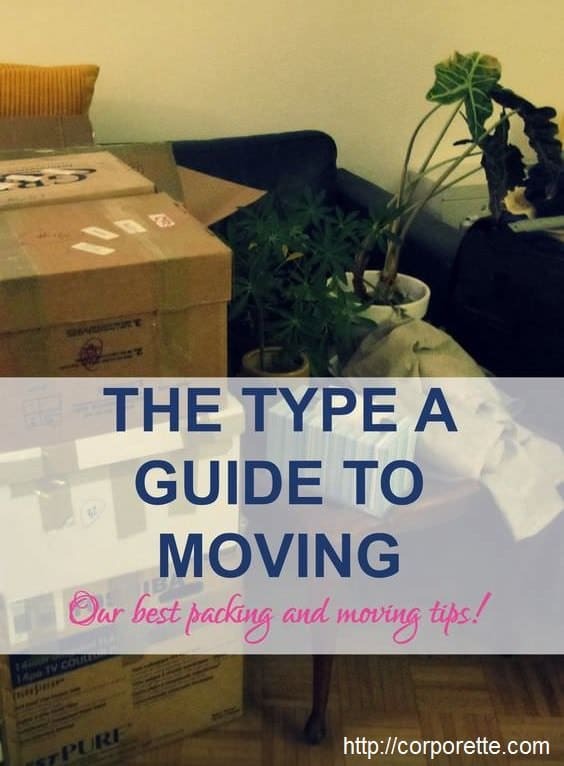 2017 Update: We still stand by this Type A Guide to Moving — you may also want to check out more recent discussions about your home, as well as some of our other organizing tips for Type A ladies. 2) Using the same address labels, print sheets that say things like: KITCHEN. BEDROOM. LIVING ROOM. You may want to affix these in numerous places on the box. This will help you get set up when the movers are coming in — they can just drop stuff off in the correct room. I also find it helpful to print up a sheet of labels that say “FRAGILE” as well as “HEAVY” — it helps you realize what shouldn’t be stacked, who can carry what, etc. 4) Figure out what can be packed first. You should look for things that won’t be missed (say, your reference books from college), as well as things that can be packed neatly away so you don’t feel like the walls are closing in. For example, I have two big Ikea Expedit bookcases filled with stuff, and they’re my favorite place to start. Not only can I usually live without my books for a few weeks, but I can also stuff 3 or 4 shelves worth of books into one box. As luck would have it, banker’s boxes fit perfectly on the shelves — they slide right in. It makes for an ugly apartment, for sure, but it keeps the floor space free for other packing. 5) Create boxes to UNPACK first. With kitchen stuff, particularly, I find that it’s helpful to have one box of things that are really helpful on a day to day basis. My box usually contains things such as a big pot, an Everyday pan, and perhaps a smaller saute pan, as well as hard-to-break dishes such as Corelle. Include other important tools in here <cough, wine opener, cough>. 6) Use garment bags for clothes that are already hanging. I prefer to do this because they’re so much easier to unpack, but it can cost a bit more with the movers (they may make you use special garment rack boxes). I stuff as many as will fit into one bag, and then buy long twist-ties (or loop several smaller ones together) to tie the top of the hangers together. This helps them be rehung easily, and keeps them from shifting around too much in the garment bag (which in turn helps the clothes stay on the hangers). 9) Cook ahead. If you know the next few weeks will be hectic and you’ll still be unpacking, try to prepare your diet for it. Either make a lot of freezable/microwavable meals (hello, lasagna!) or purchase a bunch of frozen entrees once you move — it will ultimately be better for your diet than ordering pizza every night for 3 weeks. 10) Make it easy to redirect mail. Once you’ve moved, use the address label sheets to print out labels that say MOVED on them (or if you’re really nice, include the former resident’s new address) so when you get the former resident’s mail, all you have to do is affix a sticker to it and throw it back in the mail. Similarly, you can change your mailing address with the post office online. Readers, what are your best moving tips? Any fun adventures or misadventures to share about your moving experiences? I normally unpack asap, but if that isn’t possible I find it helpful to have one box (or suitcase) that has everything I will need for the first day or two. I put in my chargers, towels, soap and toilet paper for the bathroom, sheets, and those kitchen things I need right away if I’m not just ordering in. When I had a car, that box would be with me in my front seat so I wouldn’t have to track it down later. I’ve found this prevents panicked nights looking for boxes with specific things or late night runs to Target. I tend to try and recycle/throw out/take to the charity shop as much stuff as possible before packing. I find that when moving it all is a prospect I am far more ruthless about stuff and therefore end up with less pointless stuff in my new place. I HATE moving, sometimes I kinda enjoy packing but I don’t enjoy unpacking half as much. If I’m moving myself, I borrow fold-up cardboard boxes from work. No idea what they are called… maybe archive boxes? Other legal-corporettes will know what I mean, the kind you take files into a closing/court in. They are great because they have handles on the side so much easier to lift and carry than closed up cardboard boxes. Yes, banker/file boxes. The ones with lids and holes in the sides to use as handles. I once sent 30 of these through the U.S. Postal Service when I was moving to Alaska. (There was no cheaper option, seriously.) I was amazed that the Postal Service preferred to carry them by the handle holes, too. This is perfect for me because I’ve officially decided to find a new place after the roommate/landlord let her loud b/f move in. Hopefully I’m moving into small, but quiet new apartment with a classmate. I usually use a big luggage for clothes and just lay them while they are still on hangers. It makes it easier to unpack and put everything straight into the closet. I remember when you posted about this b/f moving in… I take it the situation didn’t get better? Good luck with your move! I hope the classmate is an excellent roommate. Thanks! And no, the situation go so much worse. If it was just the b/f moving in, I would have considered staying to avoid moving again. They decided to do some ‘minor’ unnecessary construction including mounting the boyfriend’s television and putting in a sound system. A SOUND SYSTEM!!! That is the absolute last thing I wanted during finals and now I have to figure out where to take my online 8 hour exam on Sunday. I cannot wait until I sign a new lease and tell her I’m moving out!!! I HIGHLY recommend getting boxes from usedcardboardboxes.com. They are recycled, and way cheaper than buying them at home depot, uhaul, or wherever. They ship a whole load of them to your house, flattened. So, not a type-A tip, but definitely a cost-saving tip : ). You can also get boxes for free on craig’s list (from people who have just moved). And, I have also just gone to my local B&N and asked them for boxes. They were flat, clean (only books were ever inside), and totally free! Moving boxes always seem to be on offer on my local Freecycle board. Second the craigslist rec. Also try liquor stores. Great tips on where to get used boxes, ladies. Thanks! I’ve been lucky enough to have enough space to keep my old cardboard boxes for the next time I move, but I have also seen adverts on craigslist and just randomly driving by a house with boxes for free on the front porch. Buying new is crazy expensive. I’ve kept mine the last couple moves and it’s been amazing. Unfortunately, I’m about to move to a much bigger city, so I doubt I’ll have the space at our new place. Wal-Mart and Costco also often have carts full of big empty cardboard boxes. Also, U-Haul had a program where you could leave your used boxes in the van and they would re-sell them. Through college, I used to work in the mall. If you don’t mind a little loss of glamour, all malls have dumpster areas, typically inside the internal hallways. There is a trash area, and a cardboard dumpster away from the trash so that it stays nice and recycleable. All the stores get shipments in cardboard boxes several times a week, and all of those boxes end up in the cardboard dumpster. I dragged cardboard boxes from our shipments down to the dumpster three times a week. So every time I moved in college (which was every year), I would go back to “my” mall, go in the internal hallway (which is never locked), and hit the cardboard dumpster for a TON of nice, clean shipment boxes. They aren’t as sturdy as bankers boxes or official moving boxes, but in college, they were perfect. Your friendly sales associate at your favorite store might tell you when they get shipments (typically, Monday, Tuesday, and Thursday morning), and which door on the outside of the mall is closest to the cardboard dumpster. The key is to ask at the stores. During college, I once went behind a grocery store pick up some clean cardboard boxes near the dumpster, and got reamed by an employee for trespassing on private property. Liability issues, they said (?). Point being, I’m hugely in favor of re-use, but some businesses get touchy about their waste. I second this. I always just get boxes from liquor stores to move. Free and you know they’re sturdy. Also, depending on the season, wineries are happy to give you as many wine boxes as you want. We were up in wine country in December (far from bottling/shipping season), and casually mentioned at a few wineries that we’d love a box to go with our single-bottle purchase. The response at every place was, “Great! How many do you want? We have too many and have to throw them away. Please take them!” We ended up with over a dozen boxes, and by cutting up or removing the internal dividers, we used some of the boxes for glasses and other breakables as well as wine. I am leery of used moving boxes because of bedbugs – am I just being paranoid? I’d probably be okay with used boxes from a store or office. I use large garbage bags in lieu of garment bags (and then tie the hangers together like you mention). The garbage bags work especially well for shorter items like skirts and shirts. If you tie the bags at the top around the hanger (instead of inverting them and cutting a whole in the bottom), you can even reuse them. I save my real garment bags for my suits and dresses. Second using garbage bags! I put everything soft (bedding, towels, clothes that can be crumpled, cushions) into garbage bags. I was going to suggest this too! It works really well! O how I hate moving. But we just did it…again. One habit I’ve developed is to wrap pictures and mirrors in blankets or towels, using packing tape to secure the edges to each other. It saves us the money for packing materials (bubble wrap, cardboard) as well as the space that those linens would otherwise have taken up. I’ve used this method in 3 moves, I think, and nothing has ever broken. I totally do this, too! I also pack stuff in existing luggage, which saves me a couple of boxes. This method has never failed me yet! I take a bunch of my work clothes to the dry cleaners right before the move. This way, I don’t need to pack them and they are ready to wear while my boxes may still be only semi-unpacked. I basically plot for a week’s worth. This is a tremendous help. Re: labels, you can save a lot of hassle by just writing with a sharpie on the boxes. This has the added benefit of letting you customize. So, e.g., I will write “Kitchen – dutch oven, omlette pan, etc.” I always know where it all is. I try to have a bit of time overlap between move-in date and move-out date. It’s usually simple enough to negotiate, no extra $ required. This way, I can do things like take the things I really care about over myself. This is, of course, assuming you are moving within reasonably close proximity of your old place. Doing this, btw, can actually save you a lot of money. I once moved around the corner and basically spent the day before the movers came moving all the random stuff like lamps and plants and only had furniture and like 10 big heavy boxes for the actual movers. It also gives you the chance to have the cable/phone people come early. Either way, you should set up those appointments before the move. I also use moving as an excuse to declutter and reorganize. Last move, I donated a bunch of stuff to charity. If you’re in NYC, there’s a great organization called Housing Works that will come to your house to pick up your furniture. If they’re taking furniture, they will also take other donations (which you normally have to drop off) and I was thrilled to be able to give away a bunch of old clothes, kitchen stuff, books, etc. It’s all tax deductible, too, btw. My two best box solutions are 1. Use paper boxes from work and 2. ask your grocery store to save their produce boxes. The produce boxes for oranges, for instance, are super heavy duty. Second, if you are moving yourself (or partially yourself), get a tension shower curtain bar and put it across your backseat. Then use the garbage bag tip from above and hang your clothes on the shower rod. Love this! I’m planning on moving next month, and the BF and I have completely different ideas on how to pack (I’m a Type A and love these tips, and this article can help him follow my “rules” so he doesn’t freak out the next day trying to find work clothes). Thanks for the perfectly timed article. Just moved from Virginia to Michigan last week and did most of the things on the list. My husband and I received our items on Friday morning, and five days later, we only have three boxes left to unpack. One key thing we did was clean out as much as we could – clothes, kitchen items, books, even furniture. If we didn’t think it was worth paying to move, it went into the charity box. That, and labeling all of the boxes made this the easiest move we’ve done. How do you pick a moving company? I used Flat Rate last year when I moved from NYC to Maine, but I felt like I was really uninformed, and I got quotes that differed by over $1000 from each other. I’ll be moving from Maine to D.C. in the fall, and I have no idea how to find someone or what to look for. I went to the local Better Business Bureau’s website and filled out a form on there. It got sent to all of the top rated movers in my area, and within an hour I had businesses calling and giving me quotes. I read all of the reviews I could find for every company that responded, and didn’t consider companies that get in touch with me within 24 hours. (I figured that if they couldn’t be bothered to call me I didn’t want them touching my stuff!) I wound up using fantastic movers who had the whole thing done in 3 hours and were super professional and nice. I’m super paranoid about moving companies. The past few times I’ve moved, my husband and I rented a u-haul and had a local company load the u-haul so we could drive it across the country. We then had help unloading the truck. I’ve read a lot of horror stories about moving companies and didn’t want to give anyone else control over my things. This. I don’t think there’s any industry as plagued by scam artists as the moving industry. Cat’s story about the “supplies” is the tip of the iceberg. The FMCSA and DOT websites have some information on licenses and insurance, which are extremely helpful. Also know that if the shipper loses or damages your belongings, they’re only on the hook for like 50 cents a pound or some other ridiculous number. Once you’re in DC, I highly recommend Bookstore Movers. You can find reviews on Yelp or Angie’s List. I don’t think they do any inter-state moves, though. You might want to try ABF U-Pack…they are really honest and you pack yourself on both ends. Same idea for the “pack yourself” crates. You need about ten truck-feet worth of stuff, but that’s not too hard once you have a mattress, boxspring, and say, a couch or table. For any interstate move, pay really good attention to the “Bill of Lading”, which is the governing document for the move and details your insurance (likely none) and what the moving company is responsible for by contract. I had a really awful experience moving from CO to CA, in which my stuff was supposed to go by truck, instead went by pallet, air-freight, and my year-old, big-girl furniture had, no joke FORKLIFT holes from where the forklift tried to get a grip on my giant pallet of stuff. Also beware of any up-front payments that seem high, or payments that have to be made at delivery–if it’s not in the bill of lading, you don’t owe it. Period. Just a funny movers story: When I last moved, I picked my moving company because one of the moving co. shared one of the surnames in its name with a surname in the name of a local law firm (to clarify, if the moving company was smith and jones, the law firm was brown, jackson, and jones). I asked, and if I recall correctly, there was some relation. I guess I figured that the moving company wouldn’t screw me over if I knew they had connections to a law firm. Anyhow, the movers were a little slow, but they were super nice, and the very sweaty head mover guy wished me luck and gave me a very unexpected, big, sweaty hug when they left. I thought it was a little weird, but it was actually kind of nice that someone gave a hoot about me when I was so far away from home and all by myself. Don’t tell anyone, but I might have shed a little tear of gratitude for his kindness when they left. How do they know where to put the unpacked stuff? We moved a lot when I was young and my dad’s company paid for the movers. They always labeled each box with the room it came from (“daughter’s room,” “downstairs bath,” “linen closet” etc.) — upon arrival, we would be at the house to tell the movers which room now corresponded to which label. oh, I see I misunderstood the question after reading Nonny’s post more carefully — I’ve never had movers actually do the unpacking of the boxes. That would drive me *nuts* – it would take me longer to rearrange everything after they’d tried, than to just unpack myself in the first place! They don’t necessarily know which shelf to put things on, but if you give them general instructions, at least things end up being more or less in the area you want them (e.g. put the clothes in this garment box in *this* closet; put the books in this box in *this* set of shelves). Then all you have to do later is rearrange, which you can do at your leisure without mountains of packing paper and boxes in your way. You do have to expect to run around a fair bit on moving-in day and I have found it really helps to have one other person around who knows my stuff. Those movers work so quickly, it is amazing. I loved my experience using a “real” mover as well. Having done the moving-on-my-own thing many times, it was just amazing watching the pros at work. They packed up my 2BR apartment in 1/2 a day. They also have these great garment boxes that have a built in bar so your hung garments just get hung and shipped as if traveling in a giant closet. Too funny about the lard!! Yick! Yes, this sort of thing happened to me too….I was moving internationally and almost forgot to take my passport out of my dresser drawer! I remembered it *just in time*. My sister had movers in, and they packed up several full trash cans, and a coffee maker with an almost-full pot of (cold) coffee in it. Coffee, Coffee grounds, everything. We had family friends who were moving internationally, and the movers packed up the diaper genie with all the dirty diapers still inside. After my last move, I swore I will now only use real movers. The last move involved a u-haul and getting yelled at by a cop at the midtown tunnel for not stopping said u-haul fast enough for their inspection… Yea. Kind of a nightmare. Professional movers only from now on. That said, the numbering system (I had large numbers printed on color-coded paper on four sides of each box) was super-helpful when we got around to unpacking starting the next day. This has only happened to me once, but when we moved last time, my husband’s company paid for folks to come in and pack up all of our stuff. It was amazing. We personally packed the most delicate/precious items and let them do the rest. The most stress-fee pack ever! Of course, not every company will do this, but it doesn’t hurt to ask. Last time we moved, we had 2 days between the closing on our condo and the closing on our house. The moving company just kept the stuff in the truck for the 2 days for a $50/day fee, which was AWESOME. This is a good option if you have no overlap (we needed the proceeds from the condo to use on the down payment for the house). I endorse the recommendations to pack books first and to do a BIG goodwill cleanout before you start packing. Both of these are invaluable. When my friends Dr and Mrs and their three kids under age 5 had to move cross-country for his unexpected job change, Mrs – a facilities manager by training – bought a giant piece of butcher paper, taped it to their living room wall and created a HUGE calendar with everything from his start date, to the day the movers were coming to the old house, the kids’ last day at activities – EVERYTHING on this giant giant wall. To see all their plans in such a large scale was awesome – and eliminated the “didn’t you see it in Outlook?” factor. This really tickles the typeA/OCD part of me. I did this throughout law school for the last few weeks of every semester. Having all the deadlines up on the wall made it much easier for me to see how to best allocate my studying hours, and was the best way to make sure I didn’t forget little things like paying the utility bill or calling the pharmacy when I was sleep-deprived and overwhelmed by outlining. Plus it kept my husband on the same page without me having to tell him a dozen times which days my exams were. I suppose I could have done the same thing with small handwriting and a regular sized calendar, but the giant butcher paper calendar made it much easier to see everything at a glance. I also loved tearing off the past days at the end of each week – it was a great visual countdown to the finish line. I have moved a number of times both cross-town and cross-country and I am a big fan of numbering and/or labeling boxes. It also makes it easier for the movers (even if that mover is you) to drop things in the right room. To me, there is nothing more aggrevating that finding a box marked “kitchen” in the bathroom when I move into a new place. I also recommend an “Unpack Me First” box that has things you need to unpack further — box cutters, trashbags, scissors as well as things you need and want to start making your new house a home — coffeemaker, favorite mugs, favorite pillow, landline phone if you have one, etc. Also, you can buy labels for your electronic devices which were an absolute lifesaver the last time I moved. I labeled my remotes, related wires and device (DVR, TV, etc.) with matching colored tags. So I could reassemble everything when they all came out of their respective boxes with a minimum of frustration. Ah, I aspire to when the professionals move you! When my boyfriend and I moved in together, I ate down all the food I could so I wouldn’t have to deal with transporting it. Also good because it forced me to eat out my canned goods and get a little creative. When we finally got the keys to the new place, we went grocery shopping immediately so we had a stocked fridge as we were moving all the stuff in two days later. VERY helpful when you have thirsty guys who were promised beer for their efforts to have it ready to go and cold! As Kat explained, you don’t want to be so tired from all the unpacking afterwards that you end up eating pizza or something, so it made sense to get a bunch of food prior to the move. It was great to have that food all stocked – made it feel homey right from the start! You know, I realized in law school that renting a truck plus ordering pizza for my guy friends cost nearly as much as professional movers. Most movers in a big city have around a $300 minimum, and that’s about what it’ll cost for a studio apartment (you pack and unpack yourself). So, consider that when debating whether you can afford movers. The best thing to remember before you need to move a lot of stuff is to become friendly with a number of the strongest men you can find who can do the heavy lifting for you. When I was graduating from law school (but before I studied for the bar) I needed to get out of an apartment that was on the third floor. I had a sofa and a 35″ TV (Tube style) that weighed a ton! For a semester prior to graduation, I went regularly to the local college bar/hangout place every Thursday night, and became very friendly with the bartender and the bouncer. They made sure I had all the help I needed when I told them I needed to move out in May. I literally had an army of 8 big guys moving all of my stuff down the stairs and into the U-Haul I had rented. It was just too bad that I did not also have those guys come back to my parents home where I eventually had to unload all these items. All I had at home was my dad and my then 17 year old brother, who was not as strong as the guys who helped me at school. I bought the guys a few six packs of beer and some chips, and we called it a day. 2 of those guys still call on me, and it has been 7 years since I left town! These are all very helpful tips. Reading this blog entry is giving me a little deja vu. Like Kat, I used to move a lot, too. From the time I was 8 up until I finished my clerkship, moved and bought my condo in DC in 2007, I had not lived in the same place for more than two years. For years, when I was looking at cars, I would judge them by how much of my stuff could fit in them in order to move it. I will add that if you can hire a moving company to pack and move your things, I suggest doing that. I moved overseas for a federal job and the government provided this, and it was a lifesaver. I second selling or donating whatever you can beforehand. I unloaded a ton of stuff on Craigslist the last time I moved. Best tip: Leave clothes on hangers; poke little hole in garbage bag and place hole over 8 hangers or so; tie garbage bag at bottom; transpot to new home; hang clothes; rip garbage bag; voila! This is my husband’s recommendation (insistence) and it really has helped in our last 2 moves. He insists on one room that must remain box-free in the new place. Usually it is the living room, but wherever it is, he insists on having the rug put down, the furniture placed acceptably, lamps plugged in, etc on the first day. That, combined with a bottle of wine, plastic cups and cork screw in box #1, makes a really nice oasis at the end (or middle) of moving day. Seriously. I second, third, and fourth the suggestion of a box #1 for the kitchen and one for the bedroom/bath. Pack soap, shampoo, towel, toiletries, TOILET PAPER, clean clothes, and a set of sheets in the bedroom/bath box. Pack soap, corkscrew, paper towels, cleaning supplies and whatever else you cannot live without in your kitchen. I always set up my bed first thing for that exact reason. Being able to sleep comfortably is the most important thing to me on that first night. I would really love advice from anyone in Southern CA. I’m moving from New York to LA over the summer. I’ve noticed that most of the apartment complexes I’ve been looking at online – all of which are new-ish construction and nice, if not upscale – don’t mention anything about air conditioning. Is air conditioning (particularly central air) really that scarce in LA? Or is it just that no one thinks to mention it, because everyone has it? I’d really love to hear about other people’s experiences in this area – I’m going to have to completely rework my projected budget and plan on getting a more expensive place, if only the luxury apartment complexes have air conditioning. Thanks ever so much for any advice, in advance. A lot of places on the west side don’t have AC. We get lovely ocean breezes and it seldom gets that hot. There’s maybe a week a year where you might wish you had it. During that week, I go to a lot of malls and movie theaters and beaches. These places also often don’t have central heating, just a wall register in one room. Again, maybe only 1 week out of the year where you would miss it. I pile extra blankets on the bed and wear extra sweaters till it passes. If you’re looking east of say, Fairfax, or in the Valley, you will want AC, in my view. Thank you so much! I’m looking on the west side! Is it really that temperate? I’ve been looking in West LA and Westchester…is there any area in particular you would recommend? I’ll be commuting into Santa Monica. Hi — I lived in Playa Del Rey/Westchester a bazillion years ago in an old apartment that only had the wall register/heater. Truly, you did not need a/c except for about a week a year. Have fun and tell us (me!) all about it this summer in the comments! I commute from Santa Monica to Westchester. The drive north on Lincoln Boulevard from there looks really ugly to me as I go the opposite direction. Northbound on the 405 also looks consistently horrible as I go south. I’m always thankful to have the reverse drive. I’d suggest that you look in Santa Monica itself if you can swing it. It’s more expensive, but your quality of life in Los Angeles is *DIRECTLY* proportional to how horrible your commute is. Plus, Santa Monica = awesome. More affordable and less horrible commutes would be east of Santa Monica: Mar Vista, Culver City and Palms. I’m VERY fond of Culver City. Mar Vista and Palms are some of the last affordable areas on the Westside, full of UCLA students. Also, remember this is a desert. Even on hot days, the nights are cool, so you’ll most likely be fine with a window fan. And we don’t have much in the way of humidity to contend with. My advice to you: get a place with some sort of outdoor space, even if it’s just a small sliver of a balcony. It makes a huge difference to be able to sit outside. Awesome! I’ll take a closer look at those areas – I really have absolutely no idea about LA geography, so names of places that I can google is a huge, huge help. LA native here–you don’t need AC if you’re not in the Valley or further inland. No humidity plus a cheap fan will be more than enough on all but the hottest days in August/September (we get our summer late in LA, particularly in the areas that are covered in marine layer fog, like Santa Monica is). Also, I would suggest calling a realtor. If you have any friends who are realtors in NYC, they can hook you up with any NRA realtor, and realtors do help with leases in LA (and the lessor pays the commission–it’s usually free for you). A realtor can give you a quick lowdown on where to live and which communities would be best. My ma’s a realtor in LA, but not where you’re looking…in the South Bay. She does leases as favors for friends…they make no money, but earn her brownie points that more than pay back in referrals for multi-million dollar homes later. I hope you enjoy the left coast! Window units are pretty common in apartment complexes, in my experience (bring your own). They work well and aren’t that expensive, particularly if you are willing to get a used-one-season-now-I’m-moving model off craigslist! This probably isn’t something that needs to throw a wrench into your budget. Completely depends on where you’ll be in LA. In the summer the temperature at exactly the same time of day can vary 15 degrees or more depending on where you are. So a very comfortable 80 degrees downtown (it’s not humid here, so 80 is generally quite comfortable) can be an unbearable 98 in the valley. Pretty much no one has AC in the beach towns (Santa Monica – El Segundo – Manhattan Beach, etc.) and you wouldn’t need it; in the valley, it’s essential — it’s not unusual to have several days in a row of 100+ in the valley. Downtown/the basin – you might need it occasionally, probably good to have. My brother goes to school out in LA, and while they have AC in their apartment, they almost never use it. It’s not humid out there and it’s pretty cool most of the time , so you don’t really end up needing a whole lot of AC like you do in the summer in Midwest, or down South. This tip is from a girl who has moved dozens of times, and never had professionals to help (in fact, I’ve moved so much that most of my family/friends won’t even help anymore). After all the stuff is moved inside the house/door and the people helping leave, I usually find myself staring at all the boxes completely overwhelmed with where to start unpacking. My mom taught me to do these things first: Make your bed. Hang your shower curtain. Put out a roll of toilet paper. In the next 24 hours, you’re going to need all of those, and there is nothing worse than being sweaty and gross, ready to take a shower and collapase into bed and realizing you have to do those tasks. We always make the bed first! This started when I moved into my first college dorm room and we didn’t know where to start and it’s continued well on into adulthood. These are great moving tips Kat! Are you sure you aren’t an organizational professional in another life? This may be just me, but I always put the wireless router and other necessary electronic items in the “unpack first” box. The last time I moved, I had the wireless router set up by the end of the first day. Two weeks later we still hadn’t unpacked everything else. Internet was way too crucial to my life to not have that accessible as soon as the cable was hooked up. And just out of curiosity, do other people move all their coat hangers with them? I used to throw them out or recycle them and buy new ones when I got to my new place, but I realized I was spending like $50-75 on new coat hangers every time I moved (and during college and law school, I moved at least 3 times a year, it seems like). I started moving them with me, and it seems like everyone that helps me move finds that odd. I move them with me– how do you hang up your clothes if you don’t bring the hangers? I pack my clothes in a garment box from U-haul– it has a metal bar to hang clothes on. We have two or three that we save after every move. If clothes go into a box, I either leave them on the hangers or put the hangers in the box on top of the clothes. It depends what hangers you use. If you have nice ones it would get expensive to throw/rebuy. I HATE how much space they take up when I move though – it feels like they take up more space than clothes! I’ve been moving them in my laundry hamper, which has wheels. My moving tip is a good one if you are a magazine-whore like me. About two months before you move, make a list of the publications you receive. Rip the front label off with the “code” of your subscriptions. Et voila–no lost mags. The post office only forwards first class mail, and most magazines are not first class. I get sad when I miss an issue or two, and this ensures that everything makes it there. Ditto for any bills, alumni association stuff, student loans etc. I have had a lot of bad post office forwarding experiences, so I take it into my own hands in advance. Kat suggested making forwarding address labels for the former occupant of your new place…I like to do the same for myself, ie, leave a sheet of labels with “Moved: PLease Forward” and my new address. So far I have had luck when former roommates (who stay at the old place ) or new tenants (who receive the sheets of labels from my landlord) apply the stickers and forward my mail this way. Use professional packers. Do not be afraid – they are no less likely to break things than you are and they do it way faster. All of you are professional women, and it is well worth your time and stress to let someone else do the packing. In our last move, we used movers, and were moving into a larger house. I drew a color coded map of both floors of the new house. Every room including each bedroom had its own color. Labels affixed to each box indicated the room and were numbered, with a description of contents, in the marker color that coordinated with the room. I then put the maps in plastic sleeves and taped them to each exterior door being used by the movers. Furniture was labeled the same way. They knew exactly where to go with each box as they were walking into the house, and I didn’t have to move a single box after they left. Which, since I was 8 months pregnant and it was July (ugh) was a godsend. Second the many comments about having the one or two, “UNPACK FIRST” boxes with a couple of basic utensils, glasses, shower stuff, clean sheets and towels. Absolute must. I use the fancy garment boxes, but they last FOREVER–the same two have gotten me through 9 (!) moves across country and across town. I start by putting shoes, linens, or lighter boxes on the bottom–e.g. smaller boxes with light lamps packed carefully inside, pillows, boxes of shoes, etc–and then hang everything that can’t be folded and compressed for long periods of time. I then fill the space around the hung clothing with folded tank tops, t-shirts, pajamas, etc. It should be noted that you have to tape these boxes really, really well on the bottom, and the movers will groan, but they get a lot more into one box this way. I also use older towels or linens (the ones I only use to wash the car, or for the gym) as padding in boxes that carry small electronics like TVs, microwaves, stereos, etc. Sleeping bags and heavy winter coats made out of resistant materials work well for this purpose, as well. I’m surprised no one has mentioned the obvious: just have less stuff.